The 19th annual Benjamin Menschel Fellowship Exhibition opens on Tuesday, February 2 showcasing the student projects in art, architecture, design and engineering funded by the fellowship program. As it has many times in the past, this year's exhibition takes up multiple spaces throughout the Foundation Building and features photographs, documentation and other works relating to subjects both near and far. Students in their junior year, or fourth-year architecture students, can apply for the fellowship either individually or as a group. A committee of interdisciplinary faculty selects the fellows, who are awarded funding, typically capped at $4500, to pursue their projects over the summer. The program culminates with an exhibition of the work the following February. The 2015 Menschel Fellows are Lauren Bishop (Art) and Max Gideonse (Architecture); Sam Choi (Architecture) and Cassandra Engstrom (Architecture); Ari Ferdman (Art); Brandon Lockfoot (Art); and Vanessa Tai (Architecture). "This year, I see the theme of time,” says Sohnya Sayres, associate professor of humanities and the director of the Menschel Fellowship Program. “There are two projects about what is immediate and temporary—performance art (Ari Ferdman) and the hidden poetry of city bicycle messengers as they speed by (Brandon Lockfoot). 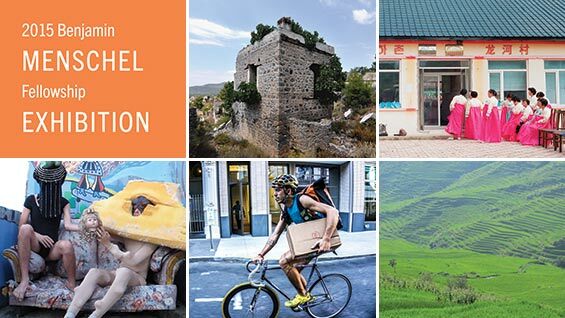 The other three projects explore long-standing cultural traditions – the Korean Joseonjok people (Sam Choi and Cassandra Engstrom), disappearing villages in Greece and Turkey (Lauren Bishop and Max Gideonse), and terrace farming in China (Vanessa Tai). The visitor is invited to contemplate what is fast and transitory, what is lost and permanent in our lives." Sayres hopes to see more engineering students apply for the program in the future. Though Menschel fellows historically travel for their projects, she says transformative research done here in a Cooper laboratory is just as encouraged. Applications for 2016 are being accepted until April 1. The 2015 Benjamin Menschel Fellowship Exhibition opens with a reception on Tuesday, February 2 from 6 to 8 p.m. in the Foundation Building, 7 East 7th Street. The exhibition will be on display through February 19, 11 a.m. to 7 p.m.